Brighten up a cake with summer flowers. Wedding cakes for summer ceremonies offer your guests a "taste" of the season! From flavors to seasonal designs, summertime is a great theme for your wedding cake. 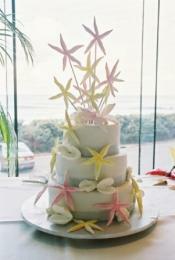 A wedding cake for a summer wedding will often reflect the season. Fruit garnishes, like strawberries and cherries, are popular. Simple wedding cakes with fresh flowers cascading down the tiers are another popular design for summer nuptials. Designs can also take the form of the summer wedding theme. Garden weddings may have a gazebo atop the cake or feature plenty of flowers that are in the outdoor setting. Beach wedding cakes with seashells, dolphins, seahorses, sandcastles, and other aquatic accessories make decorating a beach wedding a breeze. Ladybugs, butterflies, and bumble bees can also provide inspiration for a summer wedding cake. Basketweave cake designs are another popular summer cake choice. The design can be on just one layer of the cake or cover the whole thing. Basketweave design is often labor and time intensive, and may end up costing slightly more than other designs. Colored cake designs are great for summer. Pastels and bright rainbow themes can really make a cake's design stand out. Topsy-turvy cakes or "mad hatter's cakes" done with multiple colors and crooked tiers are great for a fun-loving couple getting married in the summer. Though traditional white and chocolate cakes are just as yummy in the summer as they are the rest of the year, couples often choose flavors to reflect the season. Fruit flavored cakes are perfect for the summer months. Strawberry, apple, orange, raspberry, and blueberry can be delicious and light cake flavors.Take suggestions from your wedding cake baker or designer. Not only does this person likely have a specialty you will want to try, they can also recommend flavors that have proven to be popular in the summer months. A taste-testing session can help you narrow down the possibilities and provide you with other wedding cake ideas that you never considered or previously dismissed. Dress up a white or chocolate cake by making the filling unique for summer. Chocolate wedding cakes would be refreshing with a creamy mint filling. Raspberry and dark chocolate chip filling would also be decadent in a chocolate cake. A fluffy strawberry whipped cream, orange marmalade, or lemon meringue filling can jazz up white cakes. Although many couples may not realize it, frosting is highly susceptible to summer temperatures. When in a controlled environment with air conditioning, most cakes will fare just fine. Cakes at outdoor receptions need to be treated somewhat more delicately. Fondant may be the best choice for withstanding heat. Buttercream, especially versions with real butter, can get runny and melt in extreme temperatures. Whipped cream frostings are also highly susceptible to heat and can turn sour if left out too long. 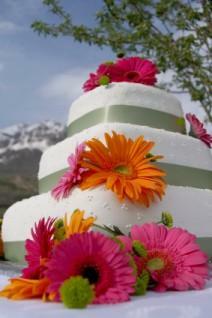 If possible, keep summer wedding cakes inside until you plan on serving them. For couples who have no option for keeping the cake cool indoors, plan to do photos with the cake as soon as possible. Place the cake in the shade or underneath a small tent to keep it shaded. Again, your baker will be able to recommend the best tasting frosting that will withstand temperature concerns in your area of the country. No hard and fast rule exists dictating that a wedding cake must actually be made of cake. Alternative desserts to cake have become trendy in recent years. Not only will this help cut costs, but allows you to showcase a favorite family recipe or two at the reception. A make-your-own ice cream sundae bar is perfect for summer weddings. Have several popular flavors, like chocolate, vanilla, and strawberry. Then, create a buffet with numerous toppings. Sprinkles, fruits, chocolate, fudge, brownies, candies and more are all perfect toppers to a sundae. Be sure to have several people hired to do the scooping, to help keep guests' fingers from getting sticky and to keep the stations more sanitary. When choosing a summer wedding cakes, you have a plethora of options. From traditional white to a red fondant, lemon filled, orange flavored cake to no "cake" at all, you can make your summer cake taste as good as it looks!